As family and friends arrive, it's always a great idea to have a few nibbles ready for them to enjoy as cooks in the kitchen place the final touches on the main courses. Many homes will be filled with the aroma of chestnut stuffing, so tantalize the taste buds with a delicious appetizer with a hidden ingredient, chestnut butter. 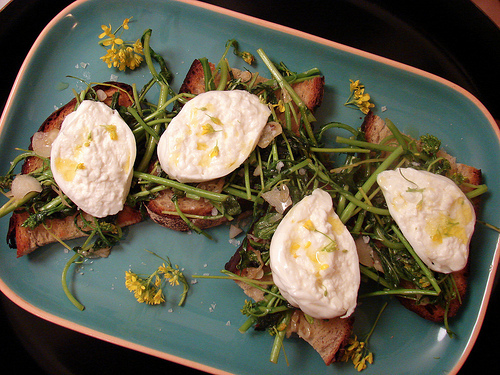 Chef Mogan Anthony of Locali Pizza Bar + Kitchen shares his recipe for “Chestnut Butter Bruschetta with Burrata, Kale or Arugula” that pairs chestnut butter with greens and Burrata. Using a sharp knife, CAREFULLY cut a cross in the top of the chestnuts, place them in a baking pan, and roast for approximately 30 min in the oven. Remove and while they are hot, use a knife to remove the shell, it can be a little tricky, but it will be worth the effort! Using the same baking pan and heat in the oven to give the hazelnuts a little roast, approximately 5-7 min until they look slightly golden and oily. In a blender add all of the roasted hazelnuts and chestnuts and blend until very fine texture. Add 1 Tablespoon of water a time (AS NEEDED) and pulse until the perfect creamy texture is reached. Season with maple syrup to taste. Keep the butter in a jar in the fridge for up to 2 weeks or maybe more.